Where did I get it? I requested it on Netgalley so thank you to Dundurn Press. Thanks also to their employee Kyle; I couldn't get the protected pdf to work (even though I tried to convert it) and he worked with me via email to get it to me - excellent customer service! What's it about? Adam is a Canadian First Nation teen whose parents left him in Fort Chipewyan to be raised by his grandfather for the first eight years of his life, and then moved him to Fort McMurray which is much bigger. At the beginning of the novel Adam is fourteen. His grandfather now lives with the family and Adam still feels bitter towards his parents for leaving him. His dad Frank works in the oil sands, where bitumen is taken from the sandy soil, and on a trip there Adam and his grandfather rescue a fish hawk that is covered in oil. Adam is a long distance runner, but he's just been diagnosed with leukaemia. Through the novel, his grandfather takes to calling him Hawk, in line with their ancestry, and Hawk and his family start to question whether run offs and poison from the oil industry is leading to cancers among the First Nation people in Chip, and whether it has led to Hawk's leukaemia. Time occurs quite strangely in this novel, even though it's short. Hawk goes to hospital and ends up in a coma after a bone marrow transplant from his dad. When he comes back to McMurray, he's quite weak and tries to make friends with his former crush Chrissie and his former best friend Gemma. He wants to go to Chip with his grandfather, which his parents (with whom he has a much better relationship) agree to. They take him via one of the ice roads and leave him. Hawk and his grandfather get involved in research of the fish in the Athabasca Lake, to see if there is poison in them. Hawk is much better and must give a presentation about the lake and the toxins. At the beginning of a lot of chapters there is the story of two fish hawks, Three Talons and White Chest, who migrate north every summer to lay eggs and raise young. We see three lots of their chicks die. 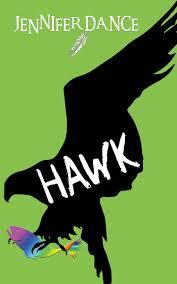 White Chest is the fish hawk that Hawk and his grandfather rescued, which they find out near the end of the novel. This is an epic novel in scope, but is quite short and I would have liked it to be longer. It was fascinating to read about these First Nation communities and how their old ways of life are being killed off, and to learn more about the environment and what the oil industry is doing. None of it is given in a preachy way, I don't think. It is an excellent novel. Are any main characters non-white? Yes. Hawk investigates his First Nation ancestry somewhat, and how the old ways sometimes conflict with the new. Are any main characters disabled either mentally or physically? When Hawk is suffering a lot, he is quite severely disabled, both in hospital and at home. Is there any talk of death? Somewhat, yes. Would I recommend the book? Yes, absolutely. Even (maybe even especially) for British teens, who may not know much about First Nation communities. How many stars? 9 out of 10. It isn't perfect but it's pretty darn close! I definitely want to read more by this author.